This is not a judgment on immigration policy or on the various positions surrounding immigration reform, or those who hold those positions. Nor is it meant to be uncaring about the people to whom the words apply. It’s simply a judgment about clarity and accuracy, which readers hold so dear. Vargas, and many others, were disappointed by this call, but ABC News/Univision may have done the best job explaining why the Times is behind the times, noting that the term “illegal immigrant” is outdated, is found to be offensive by many Latinos (irrespective of legal status), and no longer accurately reflects the debate. They polled linguists, journalists, and people in this country without legal status, and kept reaching the same conclusion: the term “illegal” modifying the word “immigrant” implicitly carries with it negative connotations that impede rather than further the debate about our serious immigration problems. Surveying the debate, which existed long before Vargas, but certainly got a boost from his public advocacy, some clear themes emerge about this struggle over language. First, “illegal” as a noun, as in “the illegals at the factory,” is offensive, largely because it transforms a human being into a negative act—the person’s entire worth devolves into nothing but illegality. In direct contrast, the phrase “illegal immigration,” which is Vargas’s preferred term to describe the phenomenon of this type of migration pattern, doesn’t carry with it the same negative overtones. Immigration references the act of immigrating—it is an action, and actions can be legal or illegal. Thus, using the word “illegal” isn’t the problem per se—it’s the linking of the word to human beings that causes offense. This may be due in large part to the fact that people have a natural tendency to adapt shorthand references for everything (a newspaper boy is a newsie, the Nationals baseball team is the Nats), leading to the unfortunate and highly negative consequence that “illegal immigrants” simply become “illegals.” We don’t do that with phrases like “illegal immigration.” No one says we must stop this problem of illegal—it simply makes no sense. But if you say we must stop “those illegals,” it is unfortunately extraordinarily clear who you mean. Some people push back that “undocumented immigrant,” Vargas’s proposed solution (and one used by many, including some ImmigrationImpact.com authors) can also be problematic. For instance, the Times noted that to be “undocumented” suggests a bureaucratic slip-up, one that can be fixed by simply getting the right papers. In some circles, undocumented also suggests a sort of lack of due diligence on the part of the immigrant—one simply didn’t bother to get legal papers or to go to the trouble of buying fake documents. Thus, while “undocumented immigrant” is far more palatable than “illegal immigrant,” some people hear it as a euphemism—just a way to avoid saying illegal. Still, you don’t really hear people talking about those “undocumenteds,” do you? If one is striving for accuracy, there are a host of ways to describe the very diverse group of 11 million people who have no legal status in the country. 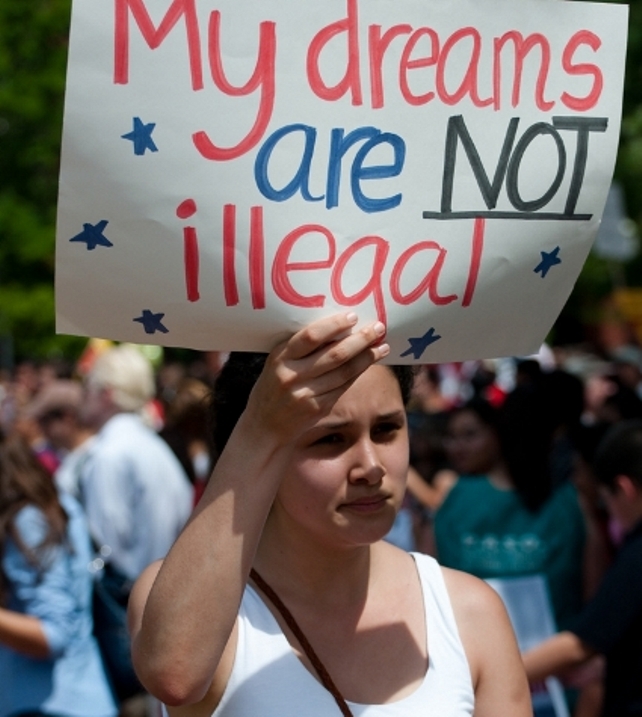 That of course, would be one of them, but “persons in the country unlawfully,” “people without legal immigration status,” “people residing unlawfully,” “unauthorized immigrants,” “unauthorized workers,” “people residing without authorization,” are also examples of terms that often describe “undocumented immigrants” with potentially greater precision in specific cases. The solution may be to refocus on residence. The gold standard for our immigration system is citizenship, followed by lawful permanent residence (LPR status). An LPR is an immigrant who intends to reside permanently in the U.S. and can, if he or she desires, eventually apply for citizenship. Many of the 11 million people living in the U.S. unlawfully have resided here for more than a decade, but there is simply no legal mechanism for them to obtain legally authorized status. At some point, we have to stop talking about illegal immigration—you know, that fluid movement of people who are here without authorization—and start talking about millions of people residing in the country without a legal status that entitles them to be here. It’s not elegant, it’s probably not 100% accurate, but it shifts the conversation away from immigration to what it really is—a segment of our population who call this country home but who can’t lawfully work, in many cases drive, or vote. They can lawfully pay taxes, however, and in some states start businesses and own property. They can go to high school, but they can’t necessarily go to college—or they can’t afford to. In other words, even in the midst of a debate over “legality,” the 11 million shadow residents of the United States are doing hundreds of thousands of things every day that are not, in and of themselves, illegal. So, of course the New York Times should stop using “illegal immigrant.” It is neither an issue of political correctness nor oversensitivity. Instead, as the debate and our understanding of the issues on immigration change, so must our language. “Illegal immigrant” doesn’t do justice to the complexities of the lives at stake and is too easily perverted by people who don’t care about those lives. While journalists are trained to edit their prose to achieve clarity, word count is less important in this case than capturing the essence of the debate. Finding more precise—if longer and sometimes clunkier—phrasing not only minimizes the negative consequences of the term “illegal immigrant,” but it also injects greater nuance into a debate that has for too long been anything but subtle.